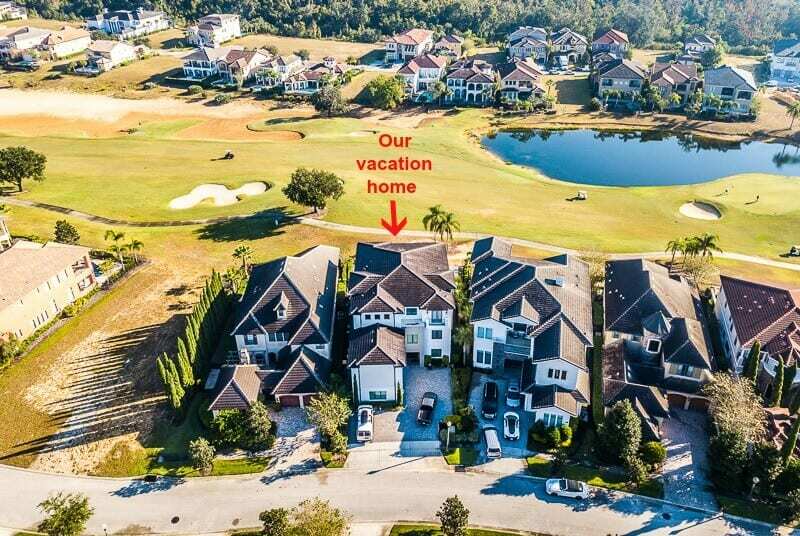 What do you do when you’re presented with an opportunity to stay in an 8,000 sq.ft Orlando vacation home with a private pool that sleeps 24 guests? Call all your friends to see who can come join you! 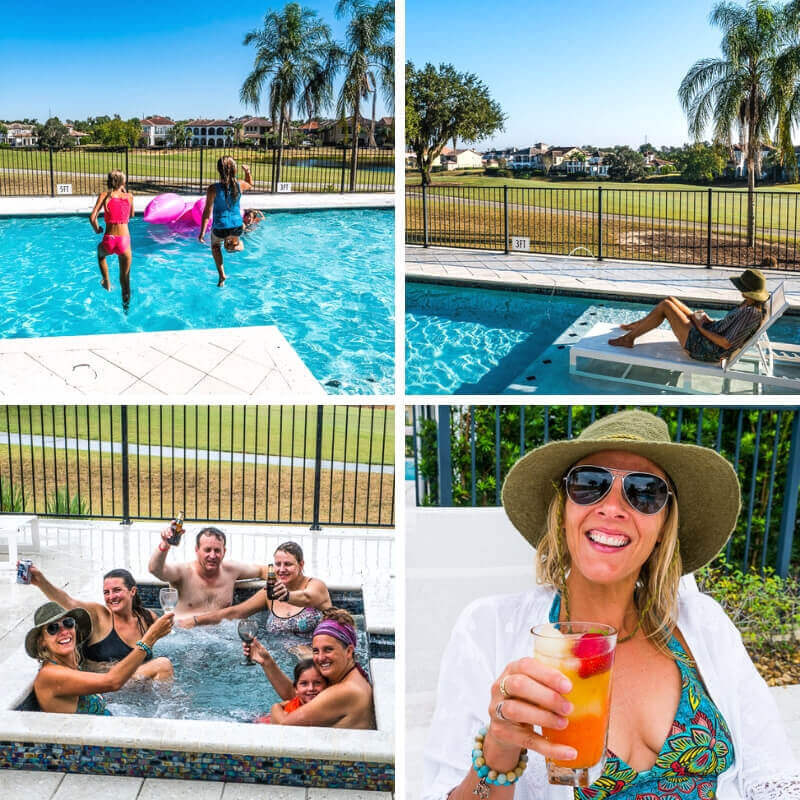 We loved staying for a week at the Reunion Resort 460 in partnership with The Top Villas Orlando. 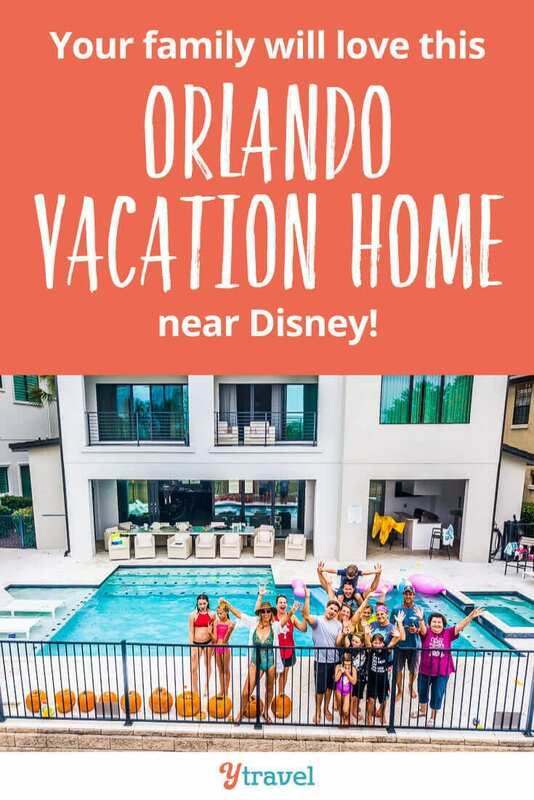 Not only because it was a relaxing luxurious stay with friends, but because we saw what a memorable, and affordable, experience it could be for you traveling to Orlando for your ultimate Disney World vacation. Disney is the place where dreams are made for large groups of people traveling together. And if you’re planning a family reunion, or a friend reunion, then Orlando vacation homes near Disney make sense. 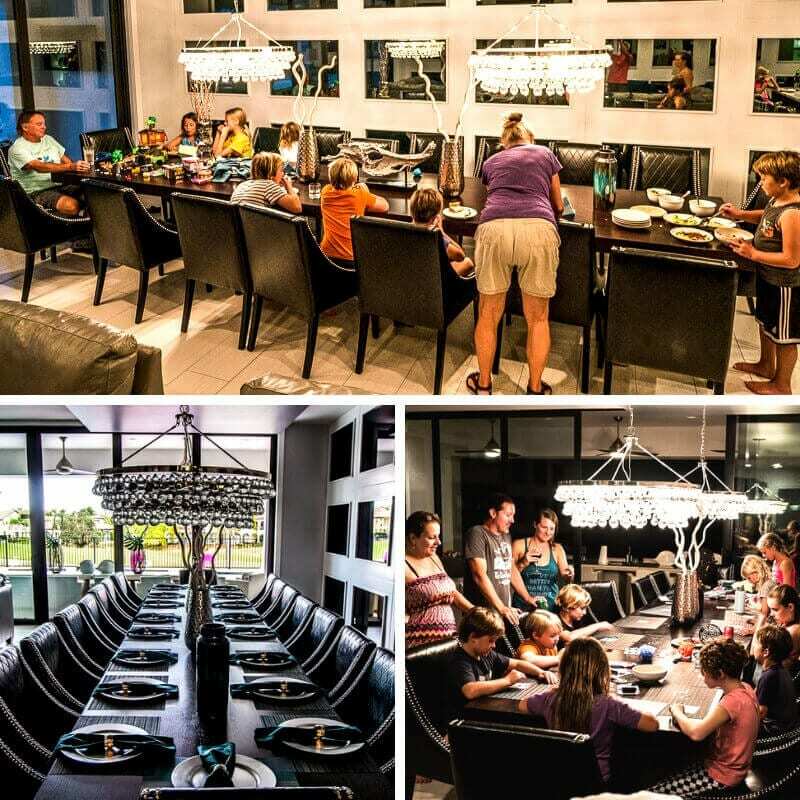 Or, if you just want a spacious house to gather with your loved ones, then Reunion Resort 460 would be the ultimate. That is pretty much what we did for the week. Most of our friends who visited have their own businesses. We have a tendency to work crazy hours, especially the travel bloggers among us. When we arrive in a destination like Florida, which is filled with many fun things to do like Universal Orlando Resort and Disney World, we want to rush out with our cameras and do as much as we possibly can so we can create content. We wanted to have a family vacation for once with our close friends. Work Less. Swim in a private pool. Relax in hot tubs more. Play pool. Chat over wine and dinner. And hang out on third floor balconies with cool people. We’d have sporadic moments where we’d jump on the computers to do a little bit of work, because we can never leave it completely. But, with pool views like this overlooking the 14th and 15th holes of the Nicklaus golf course, it was easy to digest. We made sure we attended to our morning workouts and lingering morning coffees and a refreshing swim before we opened the laptops. Being such a large property, the noise from our group was quite well contained within. We didn’t hear any noise from the other properties the entire time we were there. Next door to us, was a large group of Brazilians who had been planning a family reunion for some time and rented out one of these family resorts near Disney World. I had no idea they were beside us enjoying themselves – we didn’t hear a single thing. So I did love that you could truly kick back and relax, have 10 kids running around having a ball in the games room with their friend reunion and not worry about disturbing the neighbors. 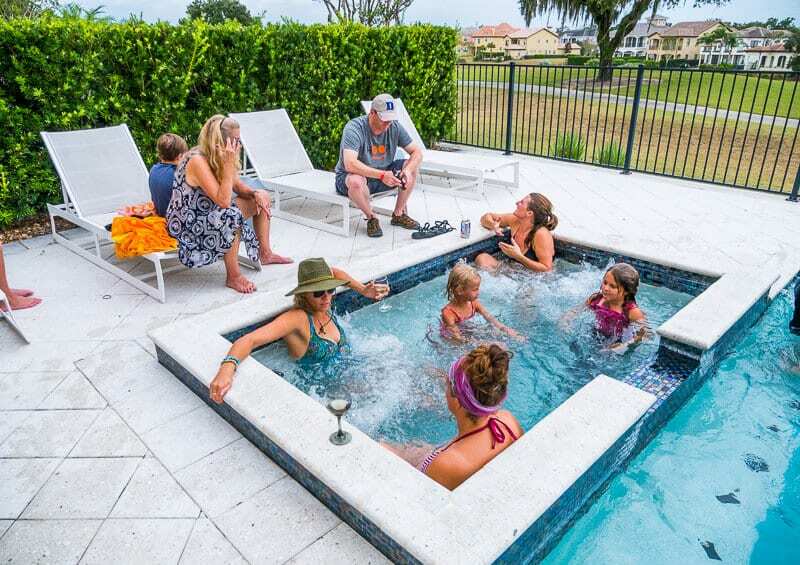 Let us help you with your friends and family reunion ideas by showing you Reunion Resort 460 near Disney World (and the fun you can have in this huge house). 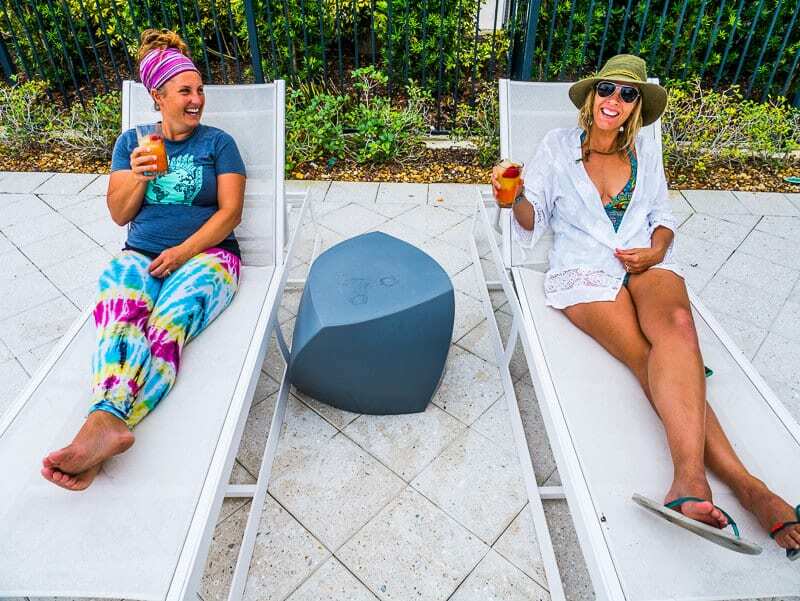 We used the pool area for morning yoga, coffee chats, BBQ’s, sunset drinks, endless pool fun, and golf gazing. There’s a covered lanai which can keep you out of the sun and cool, with an al fresco dining setting. These are the kind of offices digital nomads dream of. It made it easy for us to watch the kids while they had fun in the pool and we got a bit of work done or relaxed with a cup of coffee, smoothie or wine. 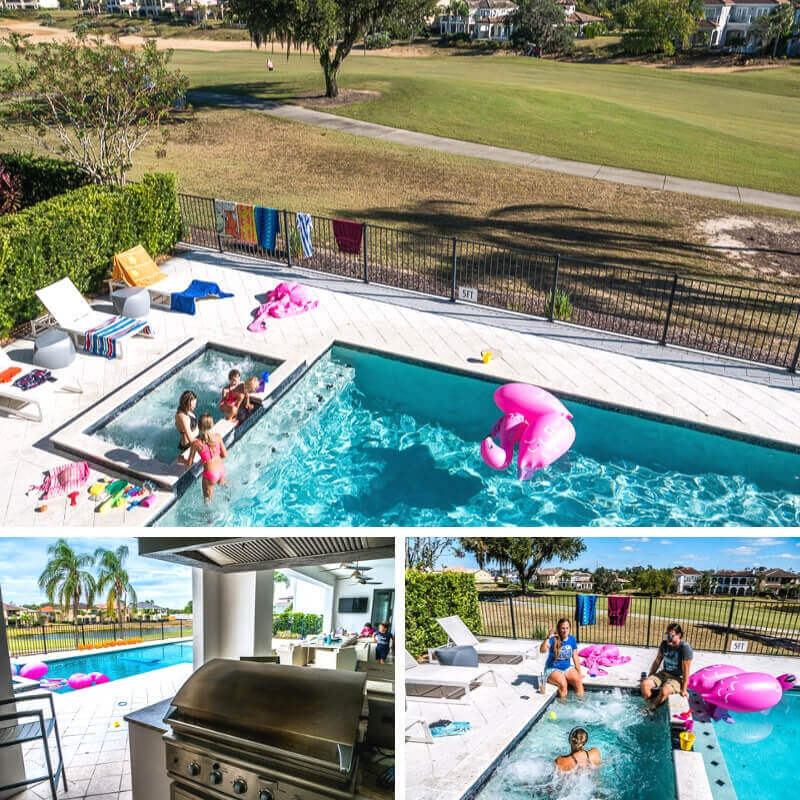 Sunday BBQ’s with NFL football on the TV screen were made possible thanks to the outdoor kitchen overlooking the pool. And the pool, complete with pink flamingos gives you ample space to play, dance and swim laps. 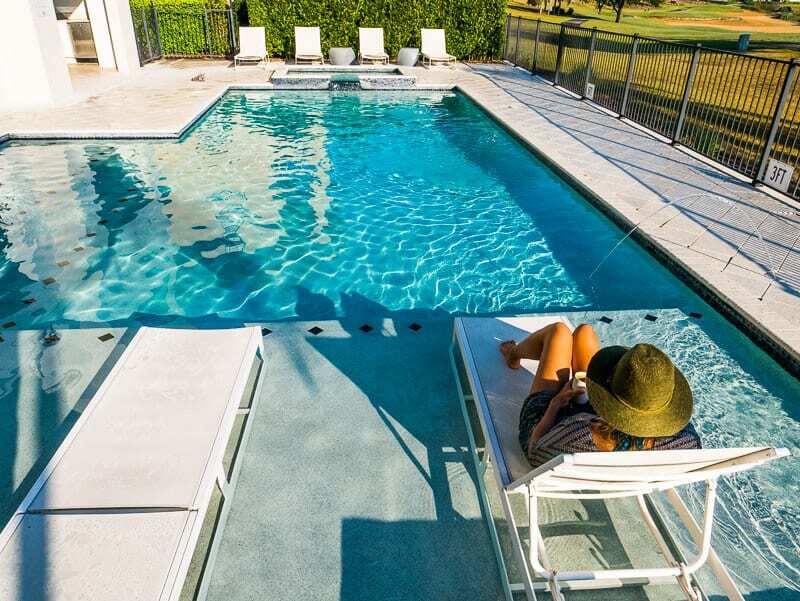 There’s a sun shelf with deck chairs to catch those morning rays and a spillover tub helping to keep the pool temperatures warm so the kids could swim all day. The hot tub wasn’t working for us the first couple of days, but once it was fixed we couldn’t keep the kids out of the pool and the adults out of the tub. I actually lamented the cool water once we had the pool temp fixed. Nothing beats diving into cold water after a workout. If the family reunion is getting a bit too much for you, you have plenty of room within the home to escape to your own space. 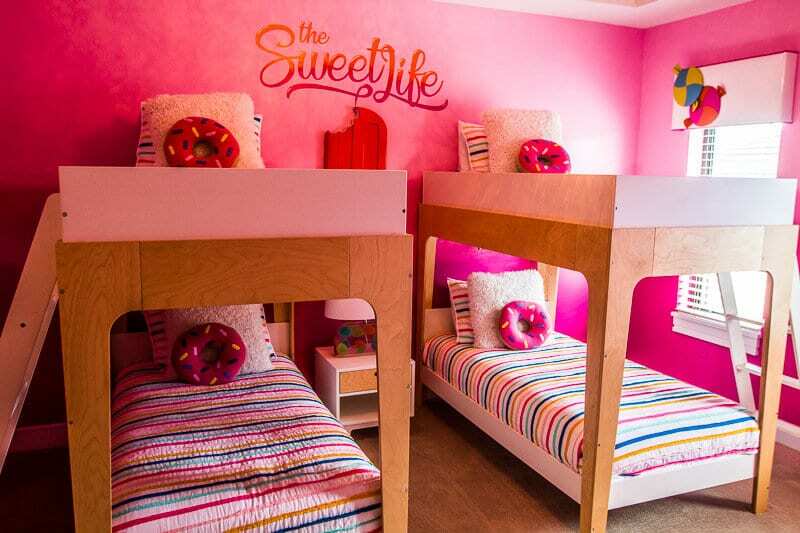 Each of the 10 bedrooms has its own end-suite bathroom and TV – even the kids. They all loved having their rooms they could play in or watch movies, especially at night, and when they couldn’t agree on what to watch in the cinema room. A great idea is for each separate family to take a floor of the house, which is what our guests did and I think this gave everyone even more privacy and space. Most of the bedrooms are on the second and third floor, with the main ensuite bedroom (huge luxurious bathroom with spa bath) on the ground floor with access to the pool area. 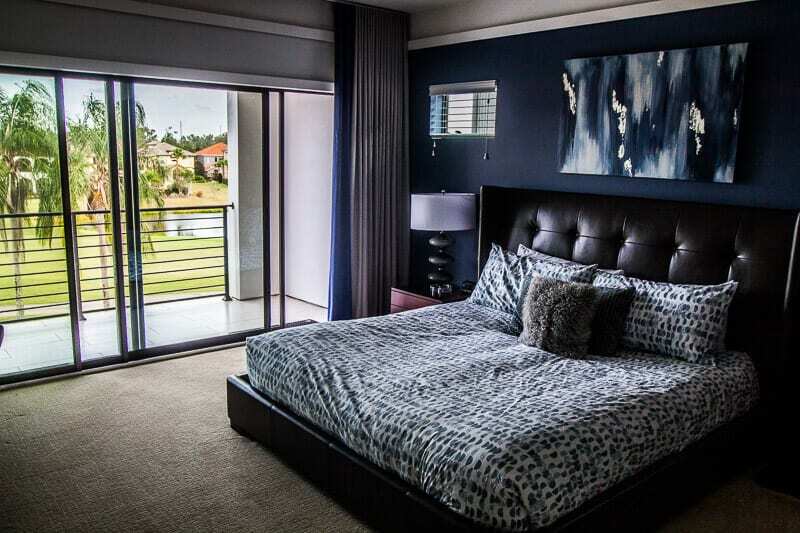 The home has 2 furnished balconies which provide great views of the pool area and golf course. Are there any Incredible fans or cup cake lovers in your family? 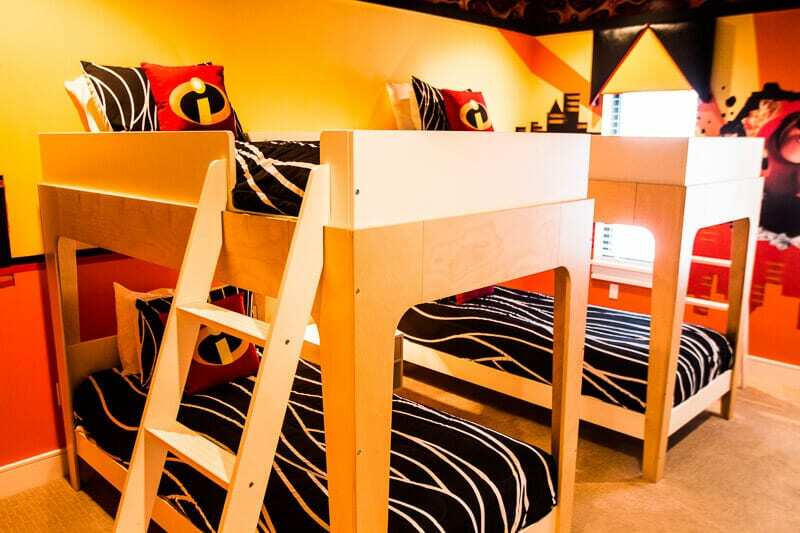 They will love the themed rooms for kids in the Reunion Resort rentals. 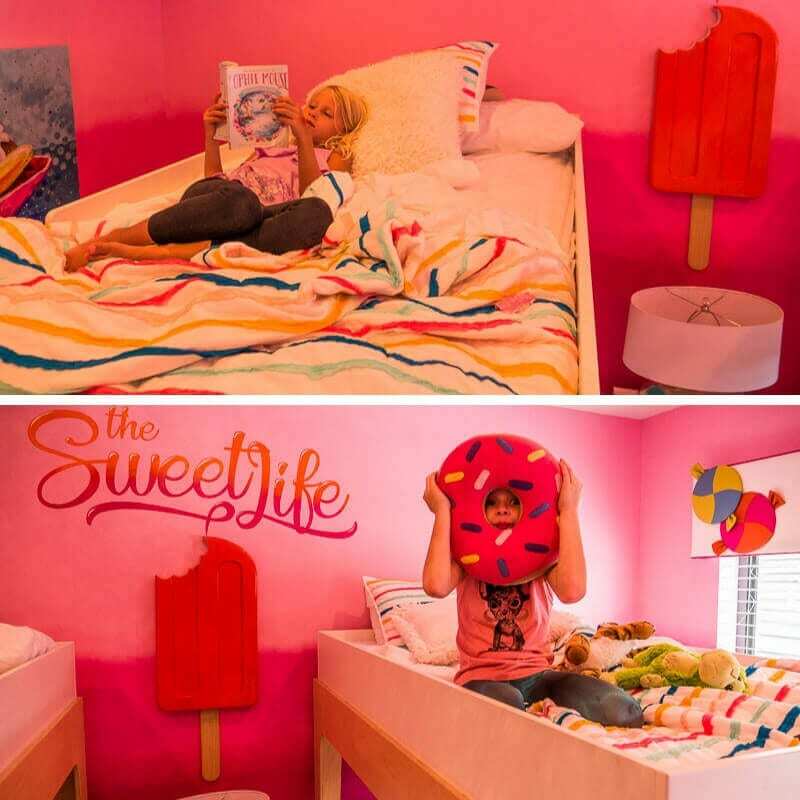 The girls across the families claimed the Sweet Life room and the boys, The Incredible’s room! They loved the themed décor and the space to play and hang out. If you have older children, there are plenty of ensuite rooms for them to choose. One room had two double beds, which a couple of the older boys grabbed a queen room, which Kalyra and her older friend Nina stayed in for a few nights. All of your parties ages and interests are catered for in the bedrooms. The girls enjoyed the bedrooms so much that every morning they would go around and make all the beds and leave notes requesting tips for their good work! It was hard to get the grandparents out of the arcade room. 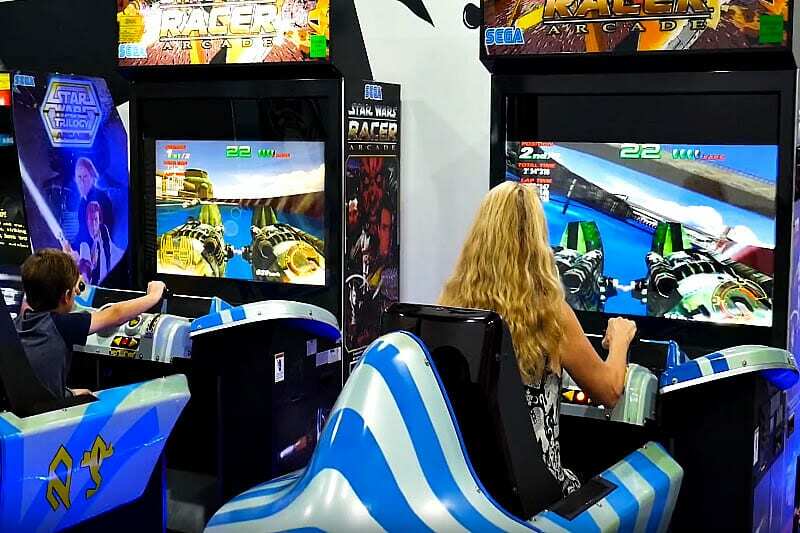 They took on a few of the grandkids with epic Star Wars adventures arcade games. 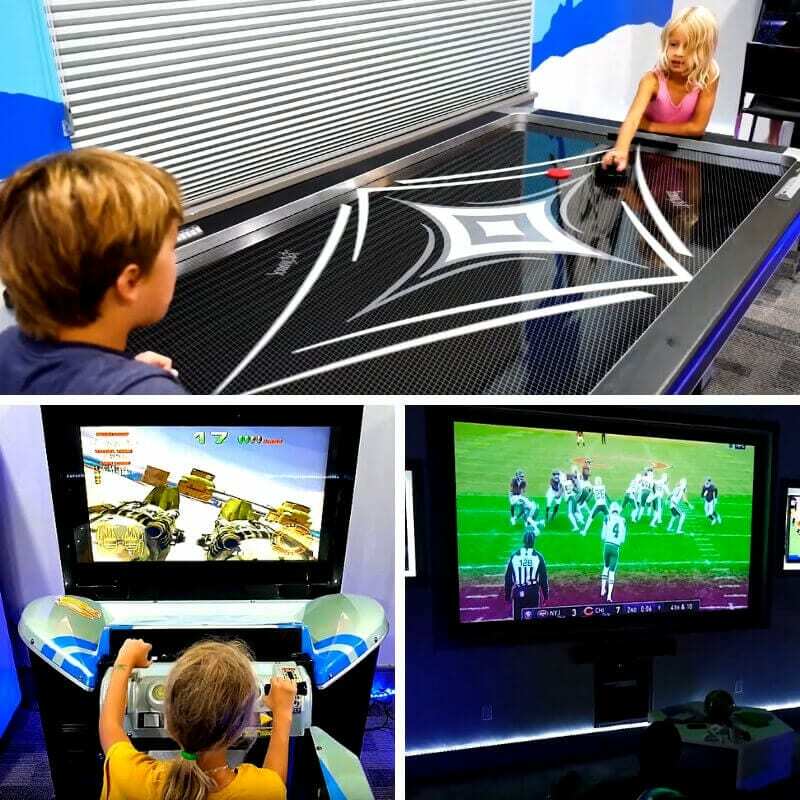 There are also some Mork and Mindy chairs, an air hockey table, and a 110 inch projector screen and two 50-inch TVs if you’re football obsessed like our crew and like to watch multiple games at once. The Arcade Game room was a fun place for people to pop in and out of. I don’t think I’ve ever stayed in a vacation rental that has had one of these before. It was a cool feature for family reunion vacations. 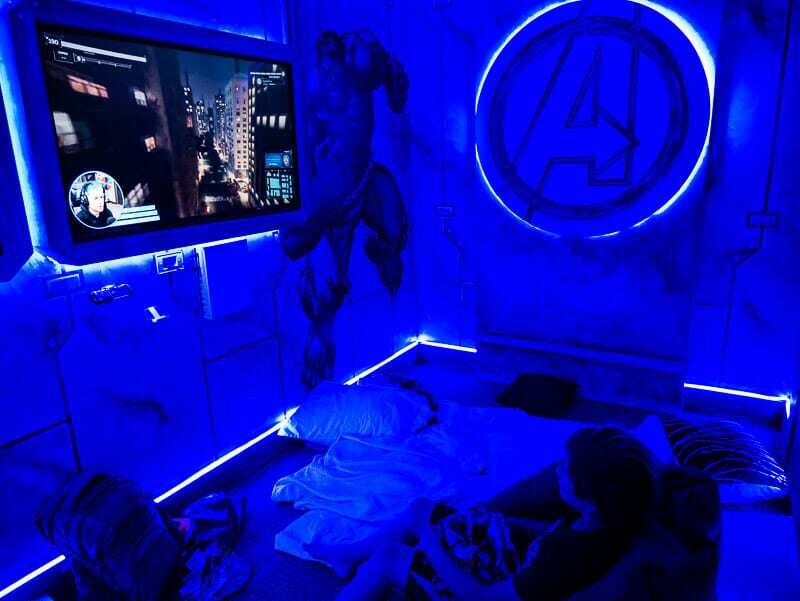 I know nothing about gaming, so can’t comment too much about the joys of this room. I know a few of the boys in our friend reunion party loved the custom built game room. I believe they hit some goals and broke some records playing the Spiderman game on the xBox. Or was it the PlayStation? Maybe it has both in there. Either way, some of the kids in your reunion party may never want to leave! 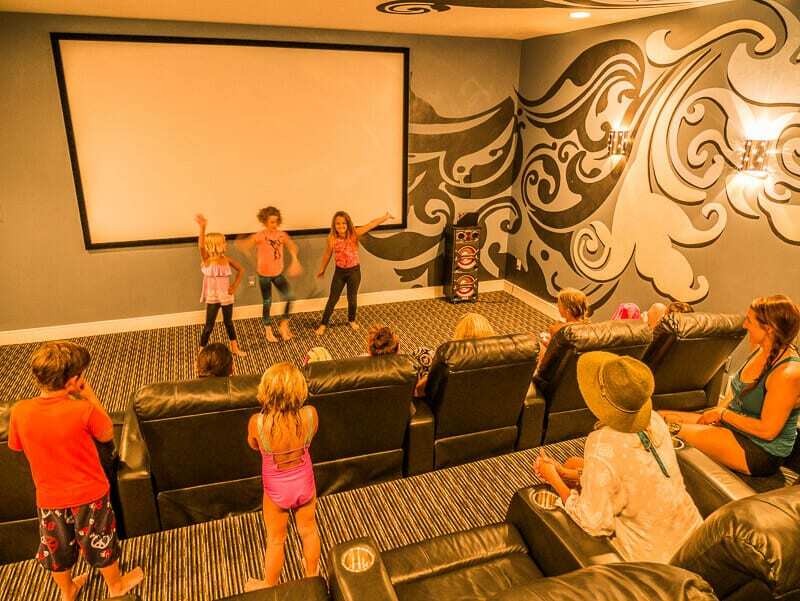 Not just a home theater with a 150” projection screen, 4K theater projector, surround sound and cinema-style recliner seating, but also a place for dance concerts and morning HIIT (High Intensity Interval Training) for me! One of my favorite memories was watching the Thriller video clip in here and dancing with everyone! I know my girls will never forget the vacation where Thriller scared them on the big screen. People watched various movies in here as well as NFL football on the big screen. The cinema has reclining seats and a karaoke machine. We all regret that we didn’t give that a go! Why is it that no matter how much space is in your open plan living area, everyone will end up congregating around the kitchen? That’s why large, kitchen-equipped vacation homes are great for families and big groups. This was the kitchen of my dreams: fully equipped with two ovens, two microwaves, and two dishwashers. 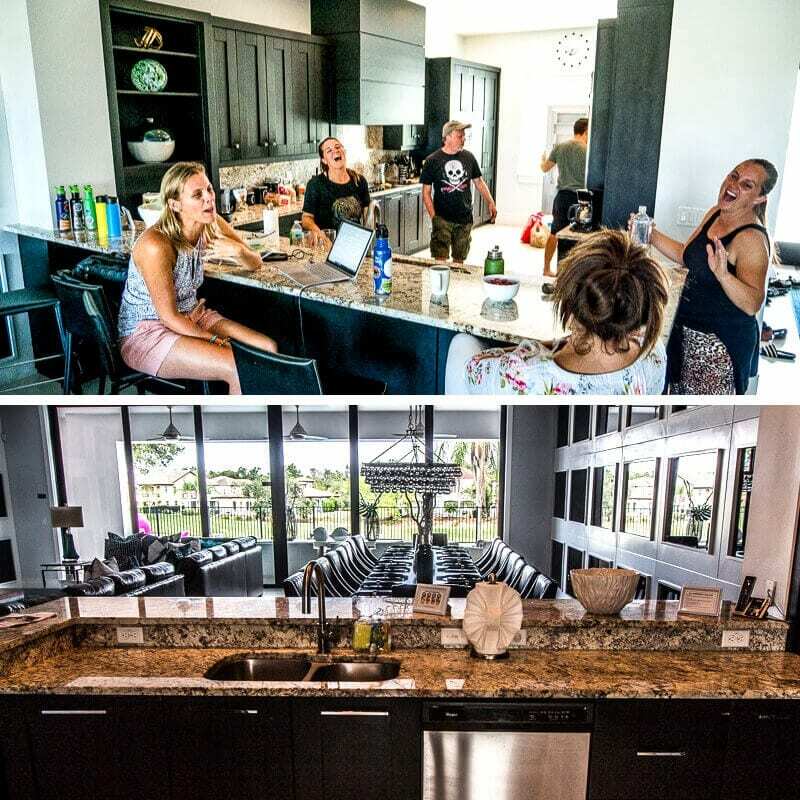 That might seem a bit over the top but when you have 22 people in a house all wanting to cook different foods, smoothies, and bulletproof coffees, you will love having these extra amenities and not have to fight for cooking space. The fridge was also gigantic and could easily store everyone’s food. Plus, a few more bar fridges scattered throughout the house ensured our drinks were always chilled and at the ready. The breakfast bar and stools meant that lots of fun conversations (and masterminding) could be had while people were cooking or working. The open plan living room was perfect for socializing with the huge TV screen and comfy couches, the dining area and the kitchen in one. 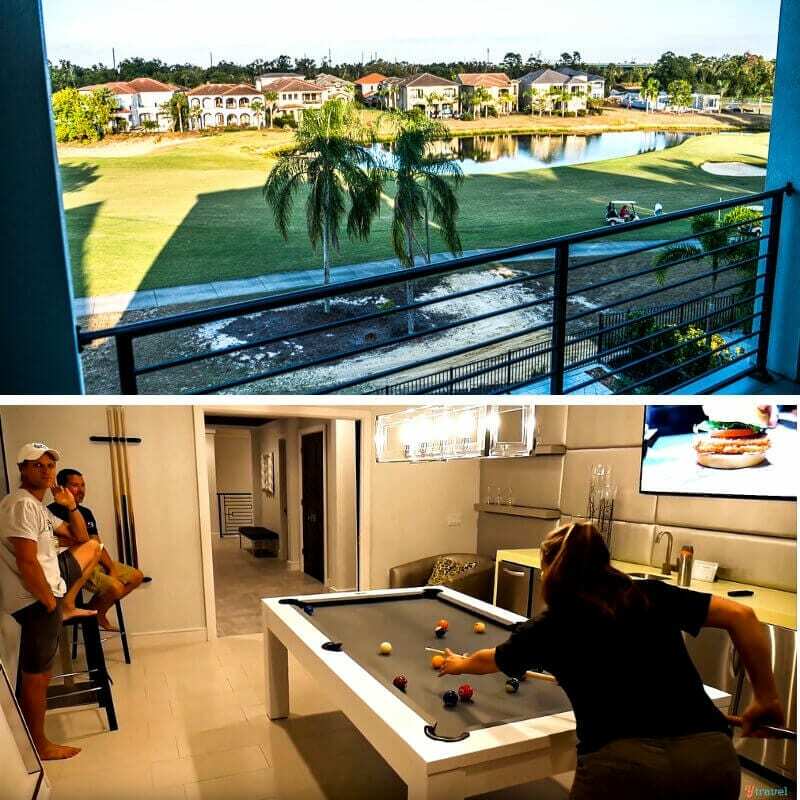 It also offered inviting views of the pool area and golf course outside. I didn’t use the comfy couches or dining table nearly as much as I wanted. We had plans to sit at the dining table with a communal, formal dinner on our last night, but it was too nice outside so we sat at the pool area table instead. We did utilize the dining table for a fun game of BINGO for the kids, with prizes. The only disappointment we had with this area was that we could not have the glass sliding doors open to let in the beautiful breeze outside and open it up even more to the outside pool deck area. If we left them open for longer than 15-seconds an alarm would sound, which could be easily turned off by pressing a button beside the door. 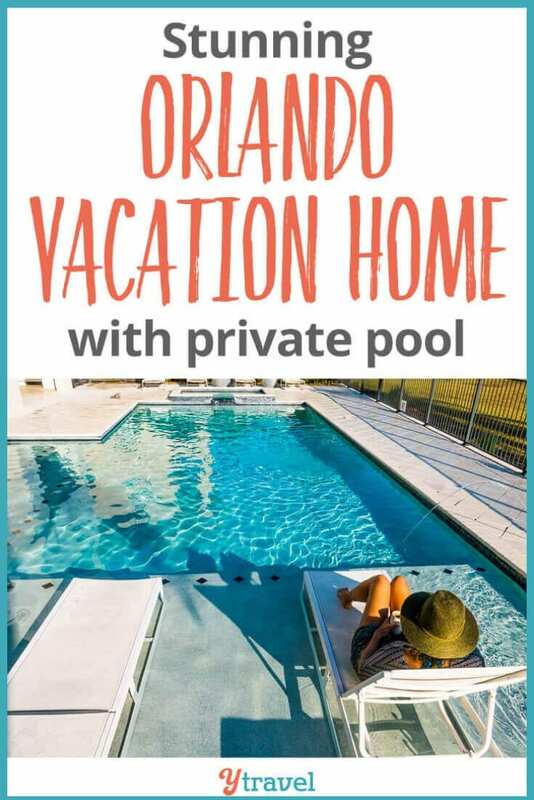 This has nothing to do with the homes though; this is a Florida law for Orlando vacation home rentals with private pools. It’s a safety requirement to protect any children who may go wandering outside unsupervised so they don’t fall in the pool and drown. We loved the third floor pool room and balcony. We had a lot of fun conversations and dancing in here. It was a great place to hang out and play pool and chat, and a good change from being downstairs. There was also a wet bar in here and a Smart TV if there were any sporting games on. The men watched a few football games and the Boston Red Sox win the World Series while playing pool. However, it may have been better downstairs so it wasn’t so noisy in the early hours for those wanting to sleep in the surrounding bedrooms! There is also a gorgeous art gallery walk in the hallway as you come up from the stairs. It’s a bright and colorful space that gives you something unique to look at. I think all our guests were impressed with the small bar fridge near the stairs on the second floor. You know just in case, you’re thirsty between floors. As mentioned, we really did not want to leave the home, and we didn’t have to. Thanks to Amazon Prime, Whole Foods, and Publix groceries we were able to order our groceries online and have it delivered to us. This made our week long stay in our luxury vacation homes in Orlando all the more enjoyable – I highly recommend you do the same. How Does the Cost of an Orlando Vacation Home Compare to Disney World Hotels? 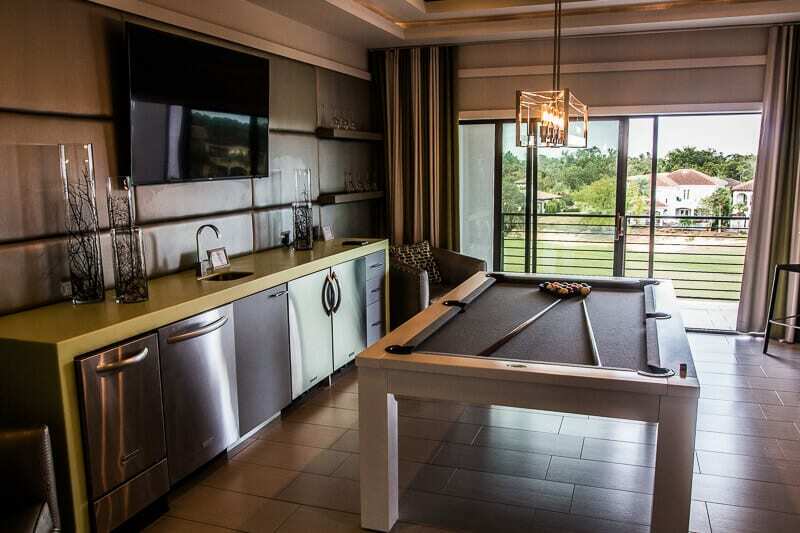 10-bedroom rental homes near Disney World like this one at Reunion Resort start from $995 per night up to $1,845 per night. It may sound expensive but it actually works out pretty cheap if you split the cost a few ways. So, for easy math, let’s say you had five families with four people in it, each family would pay $199 – $369 per night. All-Star-Music, a value resort (and the cheapest Disney World hotel), would cost around $157 per night. Wilderness Lodge, the lower end of the deluxe hotel range for a week would be around $452 per night. The benefits of staying at a Disney Hotel is that you are closer to the parks and may receive extra benefits like Magic Hour entries. However, if I was traveling with a large group of people, I would still choose a luxury vacation home through The Top Villas as it is way better value for money. And I like to spend my week doing other things besides Disney World, like relaxing! 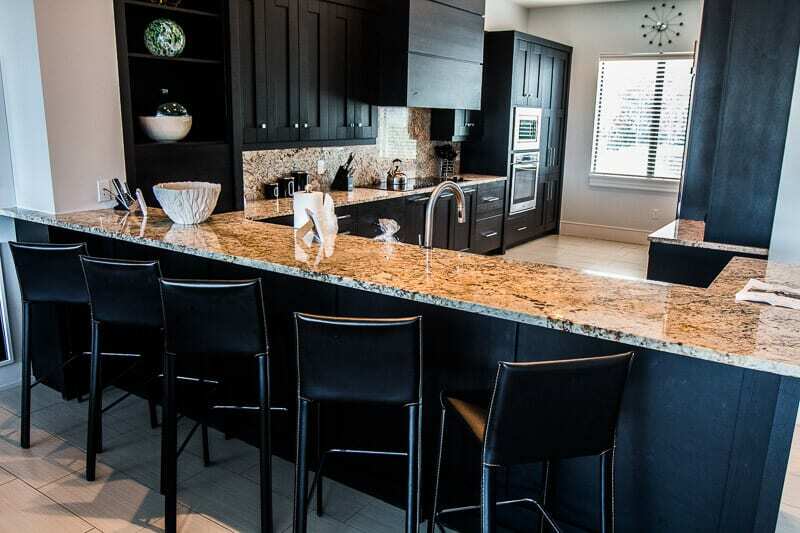 With the cost of the vacation rental, you also get access to the large kitchen which means less money spent eating out at expensive restaurants. You can find cheaper hotels outside of Disney World, some as close as a five minute drive away. You can find hotel rooms for as little as $150 a night. So to compare to our luxury vacation home in Orlando, for 7 nights for a family of four, it would cost around $1,050. 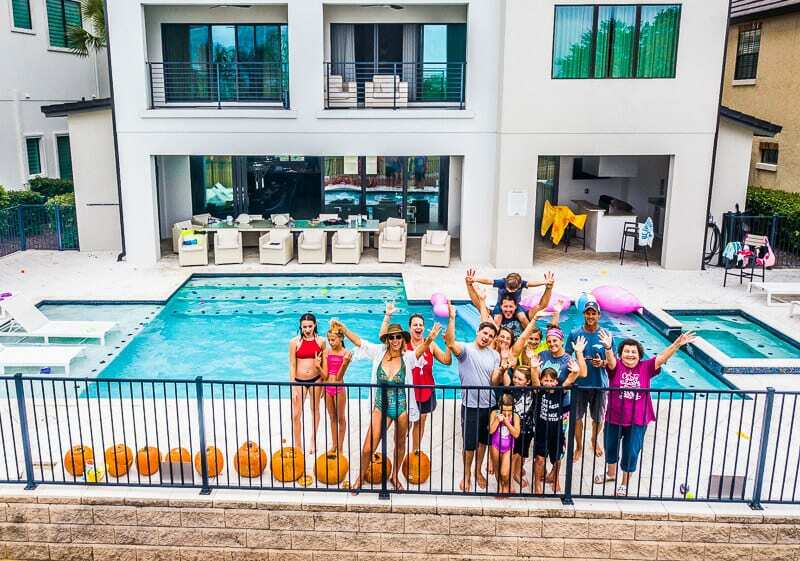 If there’s a group of you vacationing together, why not rent a mansion decked out with amazing amenities instead of being crowded into small, and separate hotel rooms? 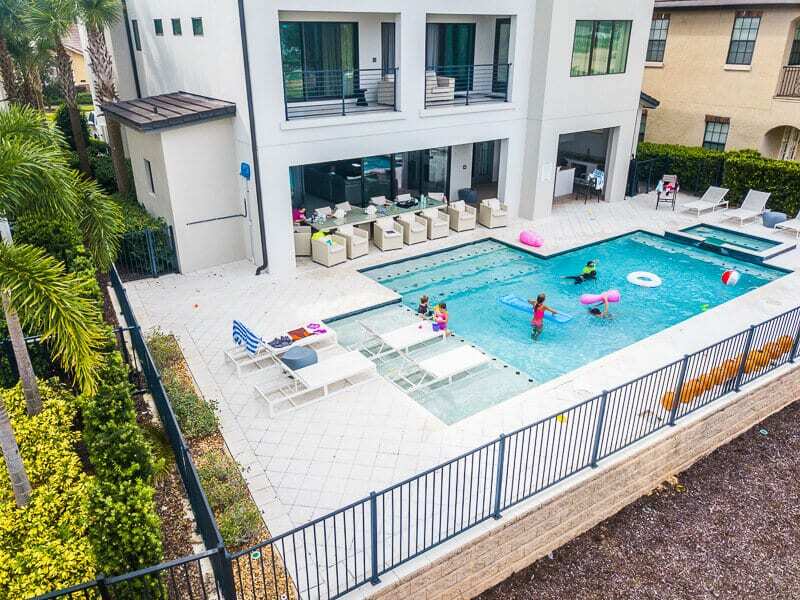 It may be cheaper for each family to stay in one of these budget hotel rooms, however, you’d also be having to eat out, which would add to your costs, and the experience just wouldn’t be as good as one of these vacation homes in Orlando, Florida. I’d still pay the extra $400 to have this luxury vacation experience instead. It really was an exceptional week we had with our friends filled with great memories! We’re camping with our friends from Crazy Family Adventure now, who stayed with us in the Reunion Resort 460, and we have been laughing at many of our memories from there. There are quite a few Orlando family resorts near Disney World. 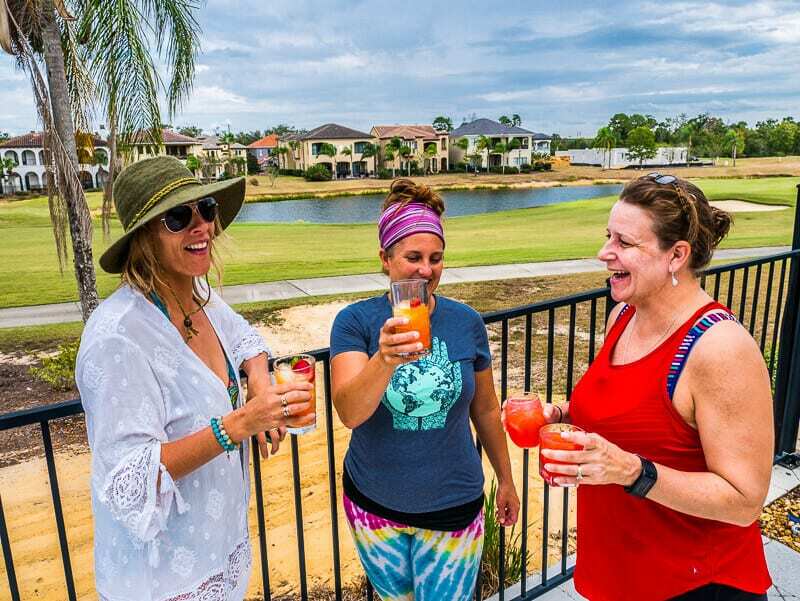 Reunion Resort vacation rentals is a world class property located 6 miles from Disney World in Kissimmee, Central Florida. It is a massive area consisting of private pool homes, condos, townhouses and villas in a variety of sizes and price ranges. 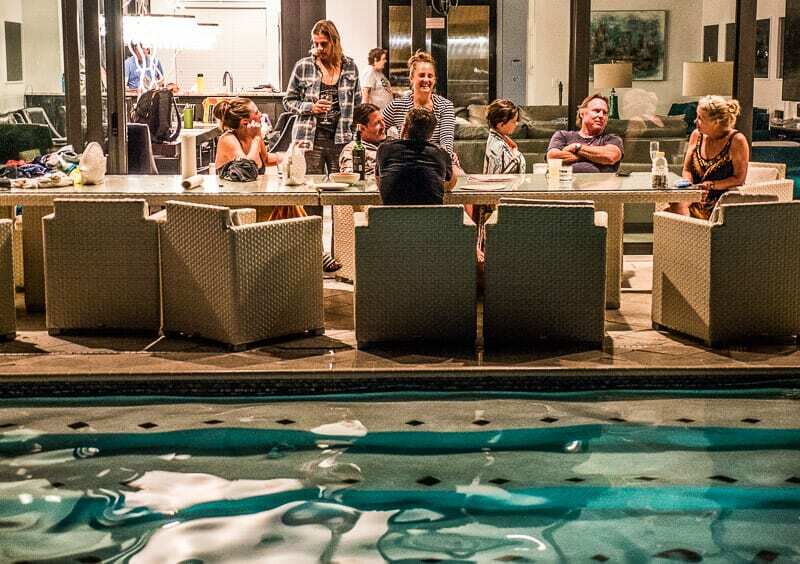 While staying in a property at this resort, you and your party will be able to use the majority of the Reunion’s amenities. So pick up your clubs, golf lovers, the resort has 3 signature-designed Reunion Resort golf courses. You can rent bikes to ride through the surrounding woodlands and parks. 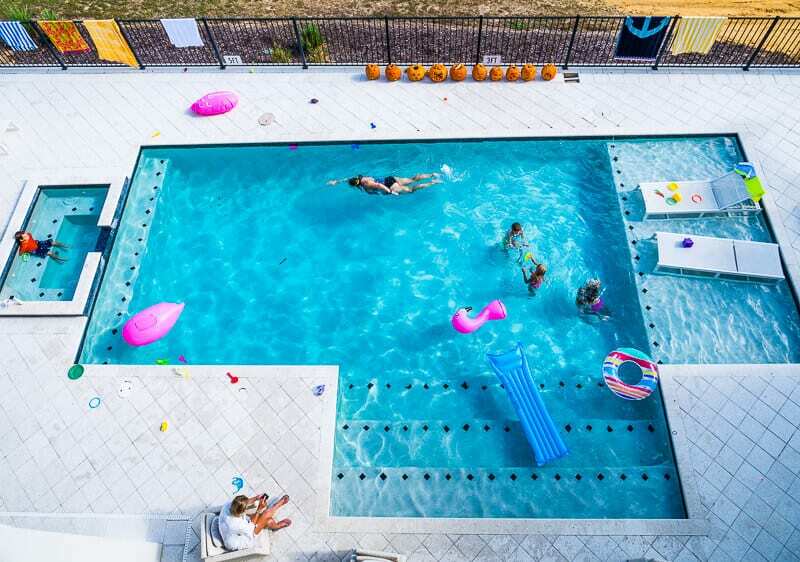 It also has tennis courts, a fitness center, boutique spa and family- friendly restaurants, and the kids will love the 5-acre water park with lazy river. Reunion Resort, Orlando FL also brings Disney World to you of a night, with views of Disney’s nightly fireworks from the rooftop steakhouse. 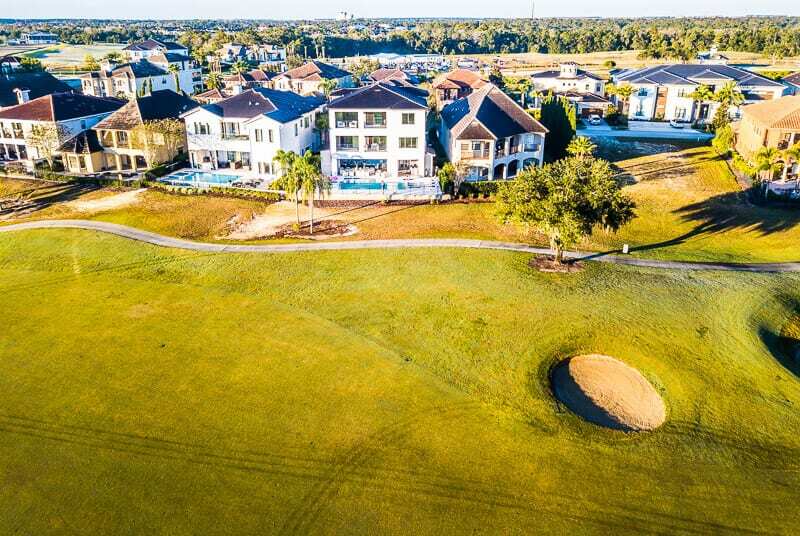 Please note this property does not have access to certain additional amenities within the resort that require Reunion Resort Membership including Reunion’s water park, tennis courts or golf courses. You can pay an extra fee to make use of these amenities. We were very content enjoying the amenities of our vacation rental in Orlando with private pool. Who Are The Top Villas Orlando? 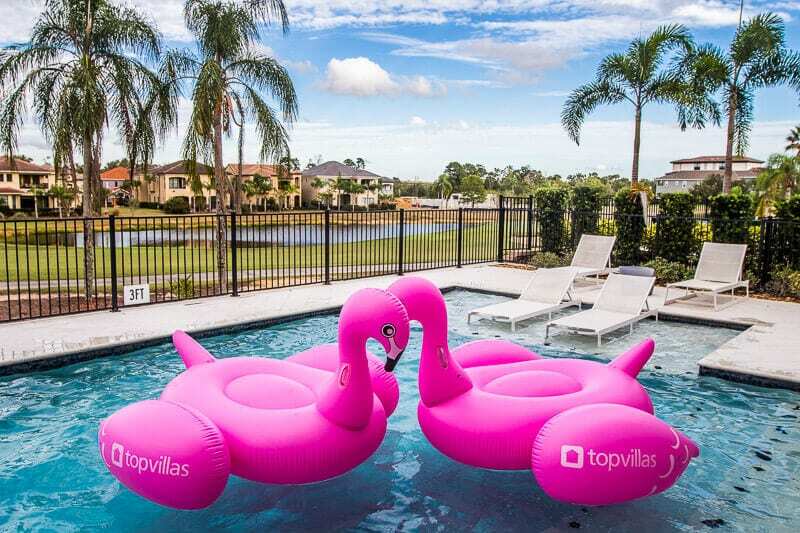 TheTopVillas.com is Orlando’s #1 luxury vacation rental company, offering the best range of 1 to 15-bedroom homes near Disney. 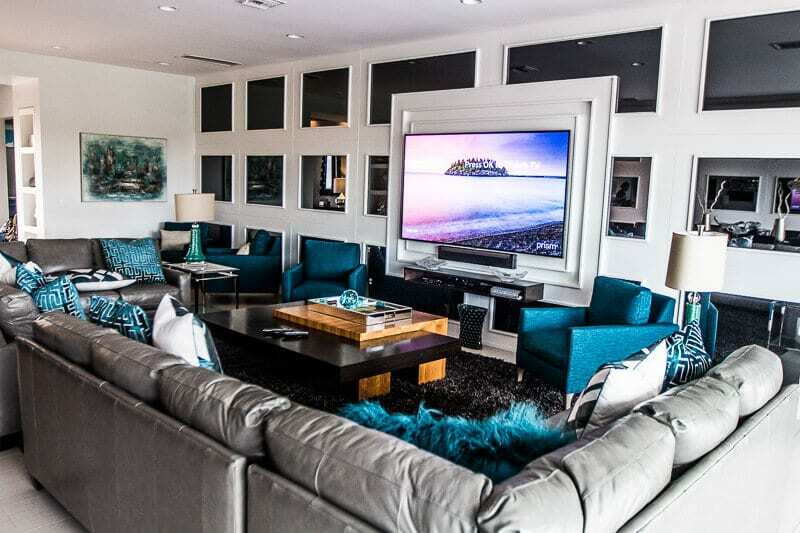 They are one of the world’s leading luxury vacation rentals websites and have carefully selected vacation rentals offer unrivalled levels of luxury from Orlando to the Caribbean. The Top Villas also has a concierge service to make planning a family reunion easier and to make your stay more relaxing. We found the communication and service at Top Villas Reunion Resort to be good. Although we did have a few issues when first checking in with the outdoor TV (thanks Florida humidity) and the hot tub not heating properly, their property management acted promptly to fix the situation. There are endless things to do in Orlando being the theme park capital of the world, and we had different friends come and go throughout the week. A few of us ventured outside the home walls to experience some Orlando Attractions. 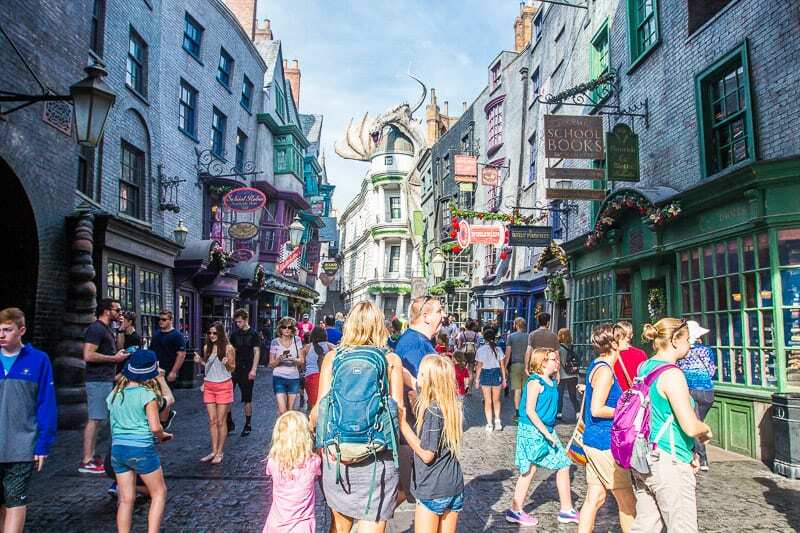 We spent one day at Universal Orlando Resort enjoying the thrill rides of Islands of Adventure and the Wizarding World of Harry Potter. A few of the girls took a trip to Cassadaga Spiritualist camp to take a look at this unique way of living immersed into the spiritual realm. Of course, I saw a medium while there! We stayed in our Kissimmee vacation rental during Halloween. That meant nights of watching Thriller movies in the cinema room, and carving pumpkins out on the pool deck. The kids had great fun working together for their pumpkin designs and we loved their lighting effect of a night lined up along the side of the pool. 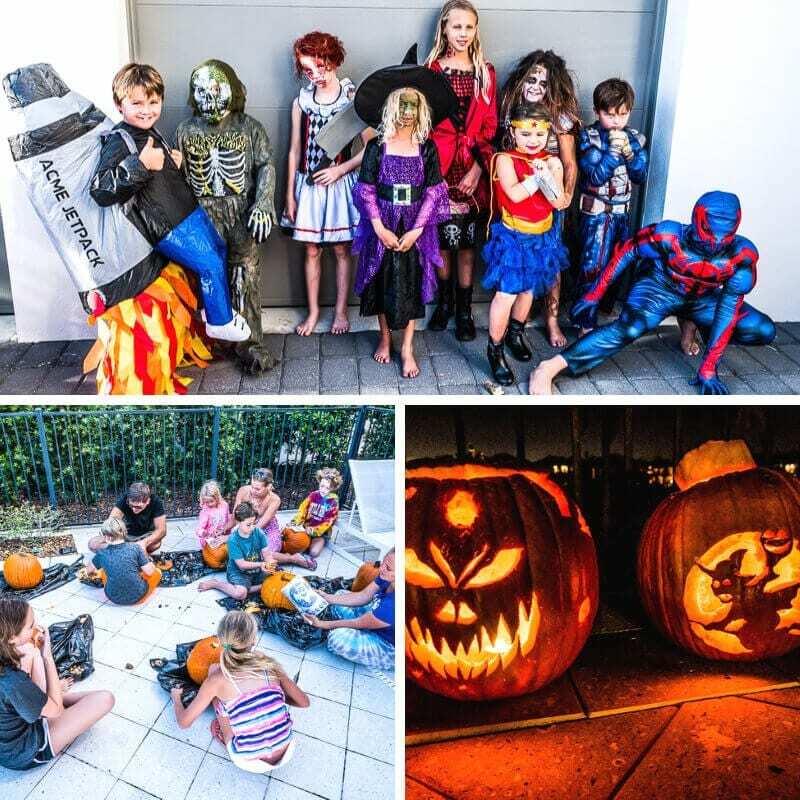 If you’re visiting Orlando during Halloween, head to the Celebration neighborhood for trick or treating. But, get there early as it is one popular neighborhood to visit. The homes were elaborately decorated and there was plenty of candy for our costumed kids. It’s kind of weird that we stayed at a vacation home close to Disney World and didn’t even visit Disney!! After spending 10 days recently at Disneyland, Anaheim with Craig’s family, we’d reached our Mickey Mouse quota for several years. We are however, thinking about future family reunion locations and considering Disney World with Craig’s family in 2020. We will absolutely rent one of these vacation villas – it’s an incredible deal and experience. 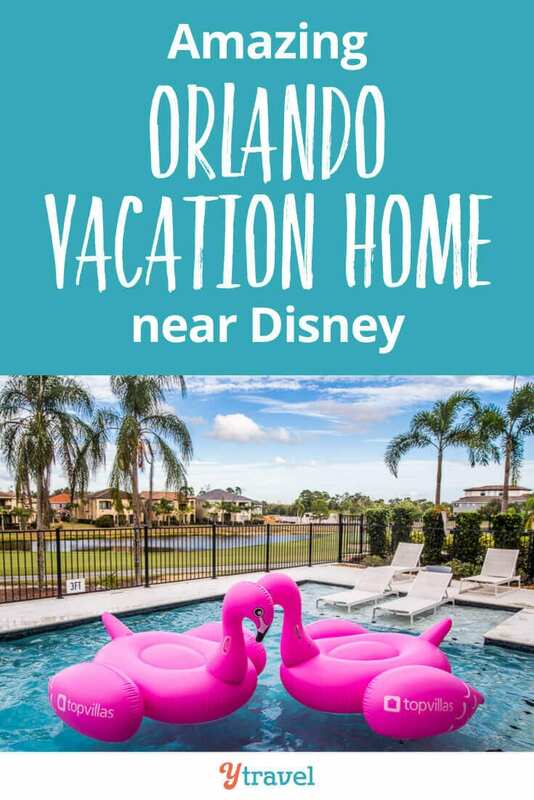 Stay in the Same Orlando Vacation Home As Ours? If you are thinking about family reunion ideas, there are a wide variety of vacation homes near Disney in the Reunion Resort region. Our home was the Reunion Resort 460. So look for that when you search over in the The Top Villas Orlando website. Or just click here to go direct to the Reunion Resort 460. Be sure to ask for some pink flamingos for the pool! 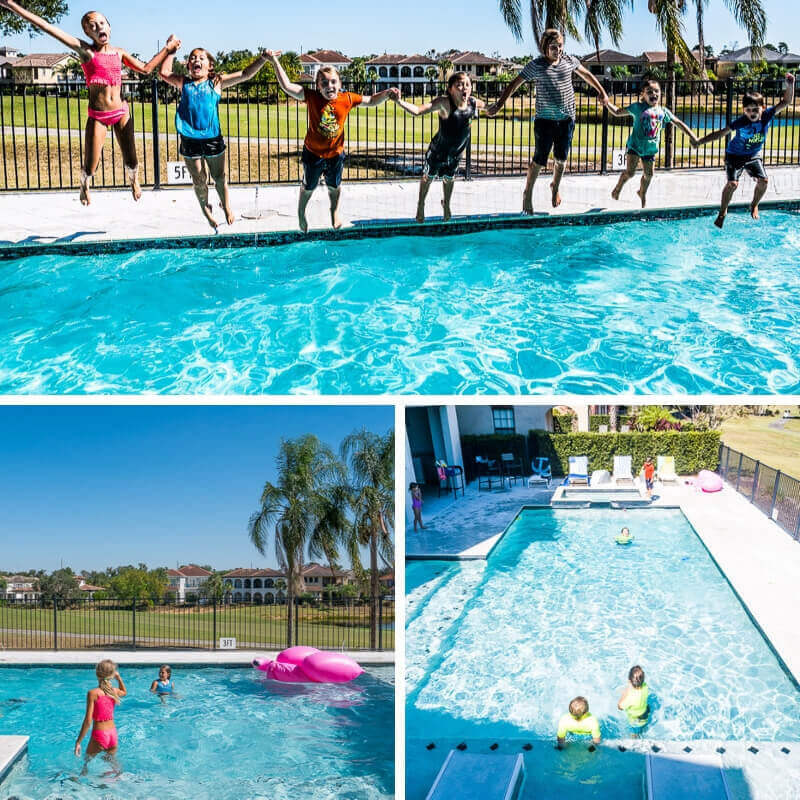 Have you stayed in any vacation rentals in Orlando FL with friends or family? Let us know in the comments.